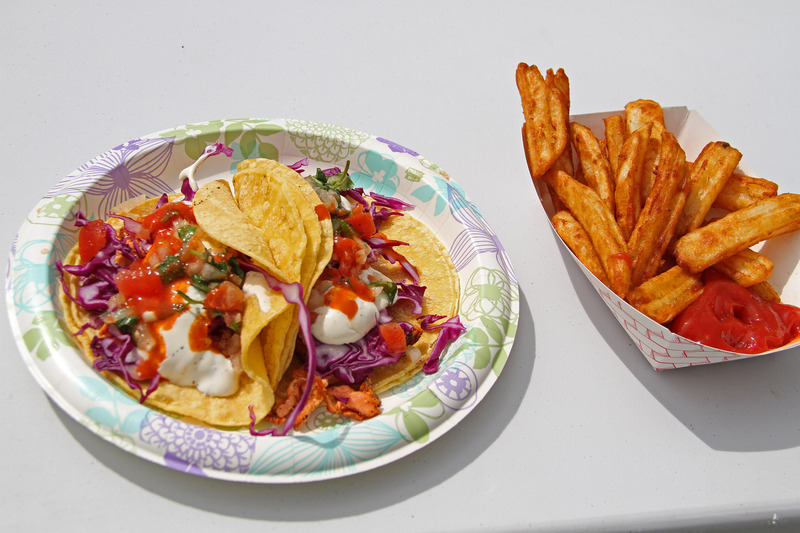 Over the past decade there have been a handful of summer pop-up street food options in Sitka. 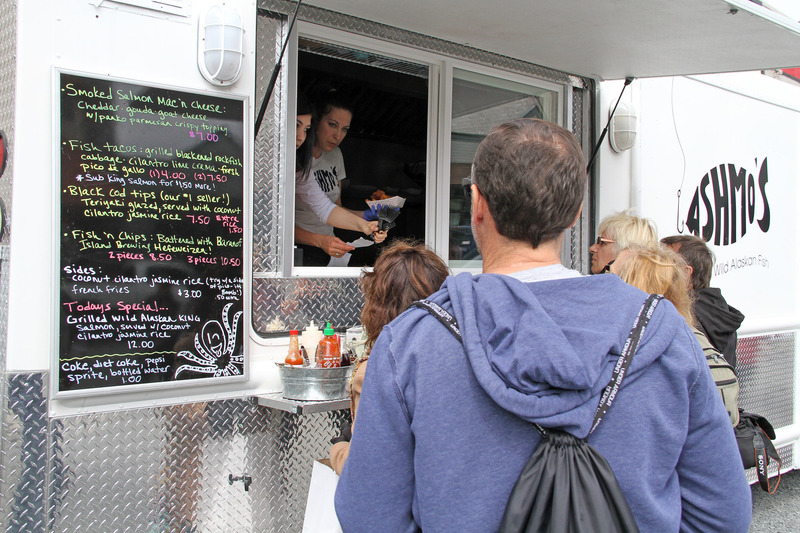 This year there are several new food trucks/carts in town, and locally sourced seafood is featured on the menu. 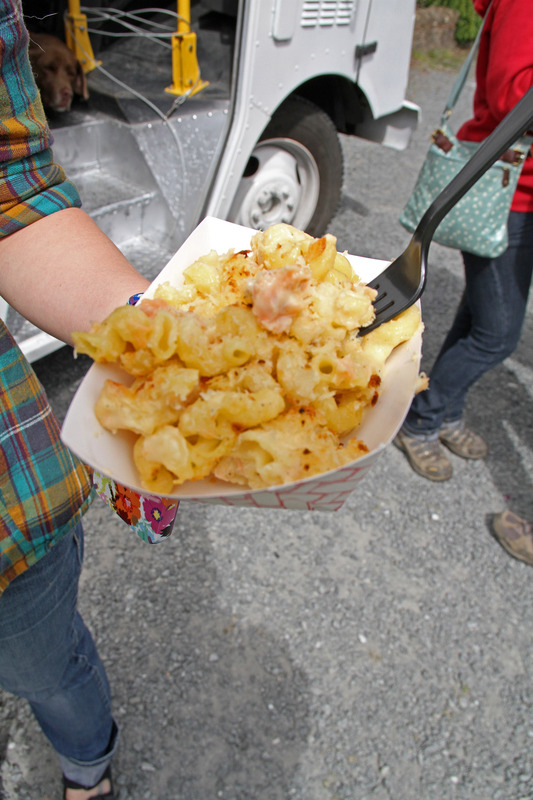 In past years some of the bigger street food options included Reindeer Red Hots (which this year will only do special events like the Sitka Farmers Market and Sitka Seafood Festival instead of holding its regular street corner), the Ludvig’s Bistro Chowder Cart (still serving lunch of clam chowder and salmon or prosciutto baguettes in the Mill Building by the Sitka Sound Science Center) and the short-lived Two Chicks and a Kabob Stick (which closed a couple of years ago, though you can still get the Inga’s Spice Blend fish rub developed for the food cart). 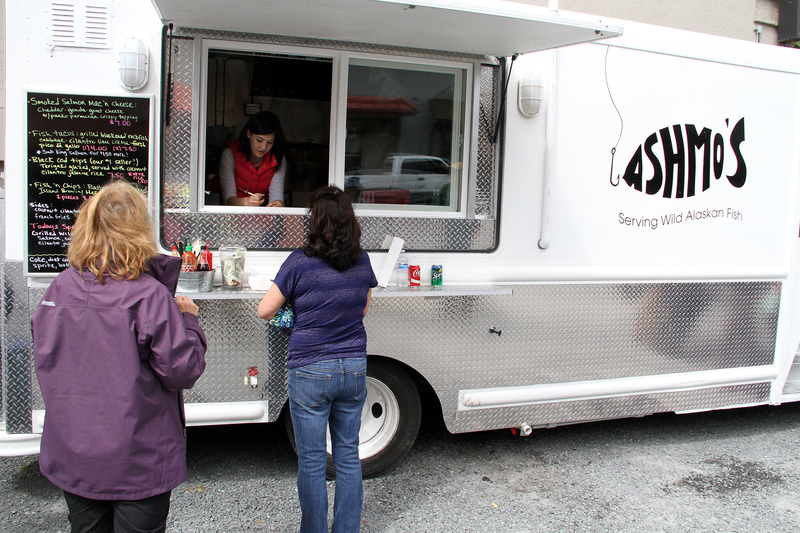 The most mobile of the new group of street food stands is Ashmo’s, a food truck owned by Ashley Moore specializing in Alaska seafood dishes. Ashmo’s has been parked out in front of the Coliseum movie theater on Lincoln Street for much of the summer. 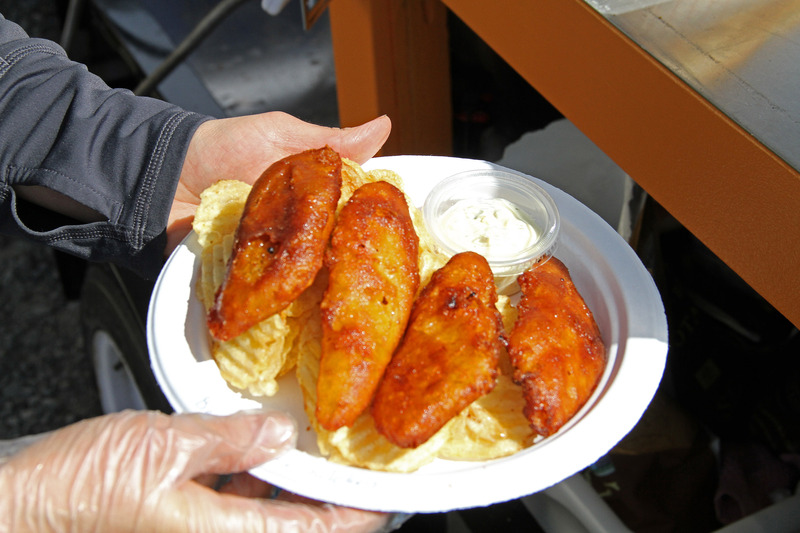 But the truck also has been available this summer at Baranof Island Brewing Company on Tuesday nights and for other special events (including the BIBCO community benefit night May 27 for the Sitka Local Foods Network), with occasional trips to the Old Sitka Docks, and by Eliason and New Thompson harbors. Ashmo’s serves a variety of seafood dishes, with a menu that does change through the week. Among the mainstays are salmon mac and cheese, rockfish tacos, BIBCO beer-battered halibut, fish (cod) and chips, blackcod collars and rice, grilled king salmon and rice, and more. Salmon sliders and salmon tacos also have been on the menu on some days. Ashmo’s is usually open during the day in front of the Coliseum, and it also has been open late nights on weekends. Ashley usually posts a weekly schedule on her Facebook site. On Harbor Drive next to Yellow Jersey Cycle Shop is Barnacle Bay Kitchen, owned by Heidi Morrison. 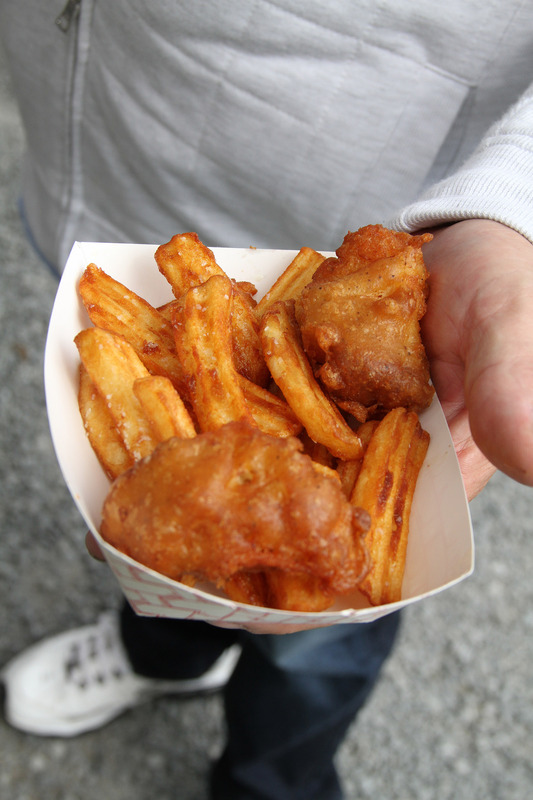 Barnacle Bay Kitchen is open for lunch on cruise ship days and sells halibut and chips, cod and chips, rockfish lumpia (egg rolls), bacon-wrapped halibut kabobs, reindeer hot dogs, beef hotdogs, and pulled pork sandwiches. In addition, Heidi has a variety of chowders available (clam, seafood, or smoked salmon, depending on the day). For more information, call Heidi at 738-8504. 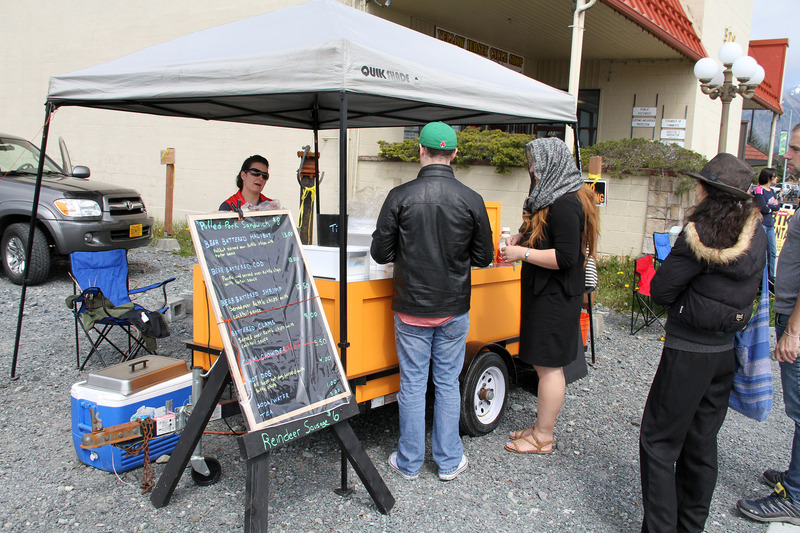 The Ráns Net pelmeni (Russian dumpling) stand actually came onto the scene in Sitka last summer, but this year owner Ayla Stromquist has a new building tucked into an alley on Lincoln Street across from Old Harbor Books and between Wintersong Soaps and the Cellar. She also has a couple of new flavors of pelmenis. Last year she had two flavors — meat (beef and pork mixed) and potato. This year she’s added chicken, smoked salmon and cream cheese, and sautéed onions. 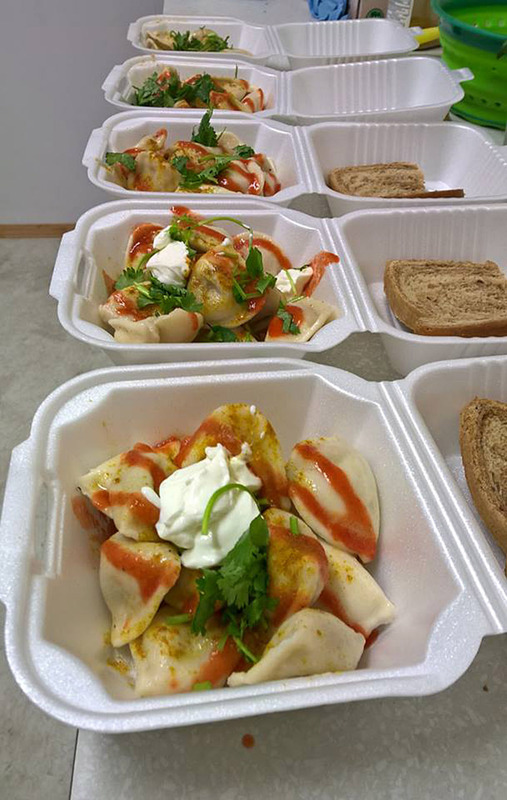 The pelmeni stand is noted for being a late-night option on weekends, but it will be open for some lunches from 11 a.m. to 2:30 p.m. on Monday, Wednesday and Saturday, for dinner from 5-8 p.m. on Friday and Saturday, and from 11 p.m. to 2 a.m. on Friday and Saturday. Ayla also said she has a new machine on order to help press the pelmenis. The stand is closed until June 11, but people can watch the Facebook page or call Ayla at 738-5804 to get updated hours. 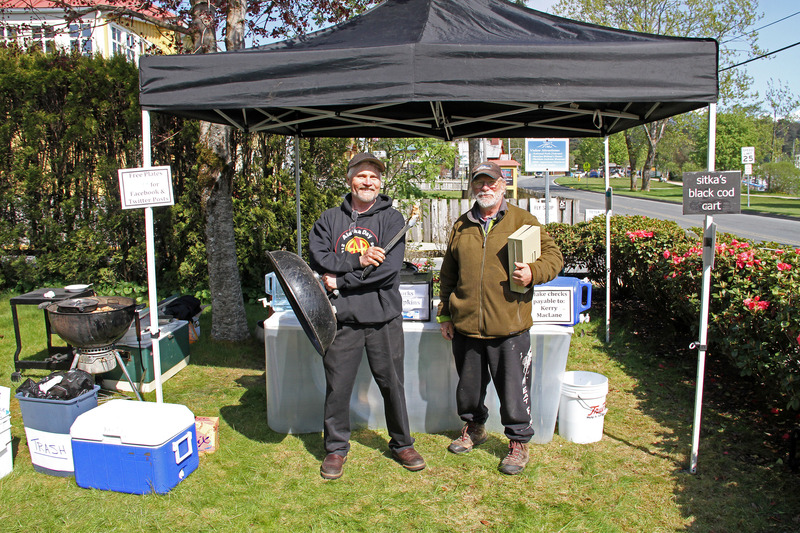 Kerry MacLane and his blackcod (sablefish) collars have been a mainstay at the Sitka Farmers Market for several years. But this year he has a tent from 10 a.m. to 2 p.m. on cruise ship days in the front lawn at Sitka Rose Gallery on Lincoln Street. 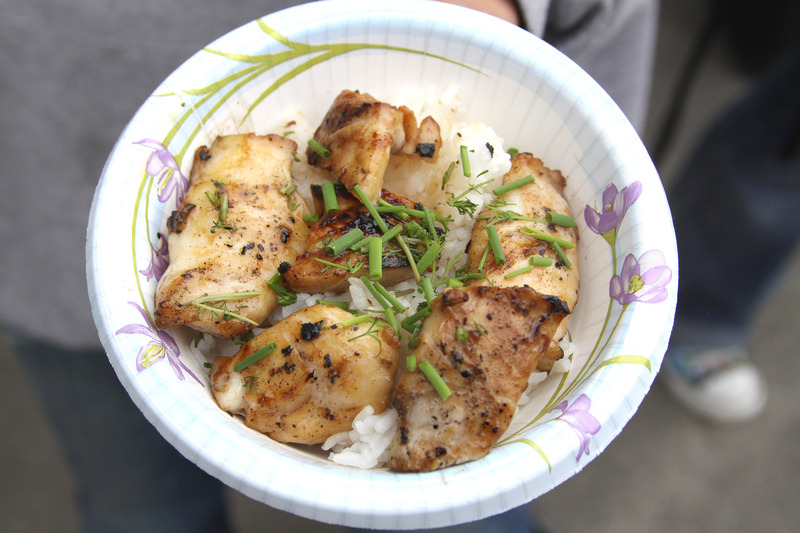 Kerry just sells one item, his BBQ grilled blackcod collars (aka blackcod tips) over rice. Kerry will reopen his stand on June 1. For more information, contact Kerry at 752-0654. 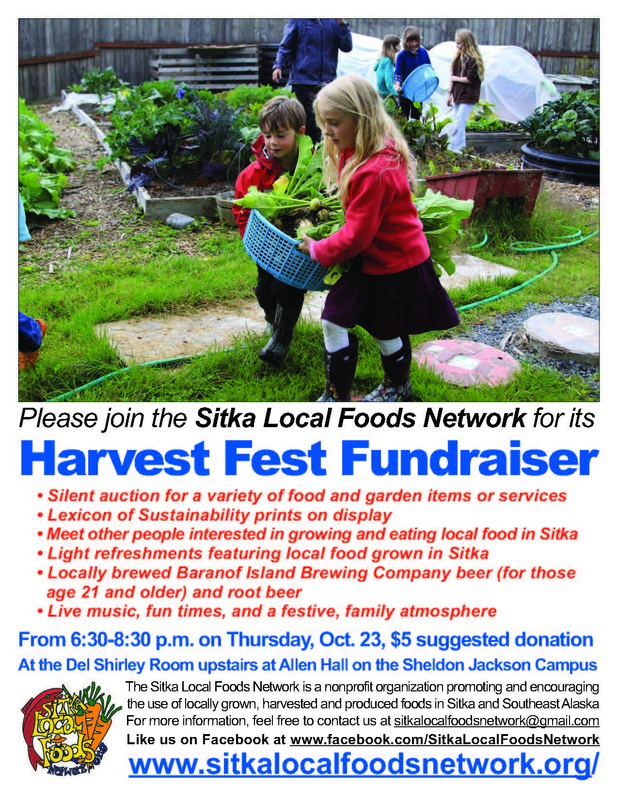 Help celebrate Food Day by joining the Sitka Local Foods Network as it hosts its inaugural Harvest Fest Fundraiser from 6:30-8:30 p.m. on Thursday, Oct. 23, at the Del Shirley Room upstairs in Allen Hall on the Sheldon Jackson Campus. A tour of and overnight stay at Finn Island Farm for 1-2 people, includes transportation, gourmet dinner and breakfast. In addition, the Lexicon of Sustainability photos will be on display, we will give a short update on the state of local food in Sitka, there will be live music, light refreshments featuring local food will be served, and we will pour locally brewed beer (for those age 21 and older) and root beer from Baranof Island Brewing Company. This is a family oriented event, and there is a suggested donation of $5. 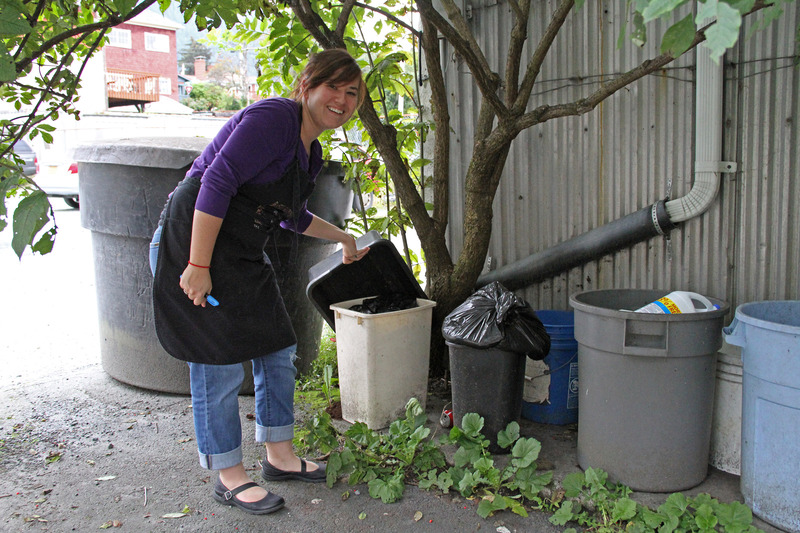 The Sitka Local Foods Network is a nonprofit organization that promotes and encourages the use of locally grown, harvested and produced foods in Sitka and Southeast Alaska. Money raised at this fundraiser will support the Sitka Farmers Market, community gardens, a community greenhouse, sustainable uses of traditional subsistence foods and education for Sitka gardeners. For more information, contact the Sitka Local Foods Network at sitkalocalfoodsnetwork@gmail.org. Today (Thursday, Oct. 2) Alaskans began receiving their Alaska Permanent Fund Dividend checks, which are $1,884 this year. 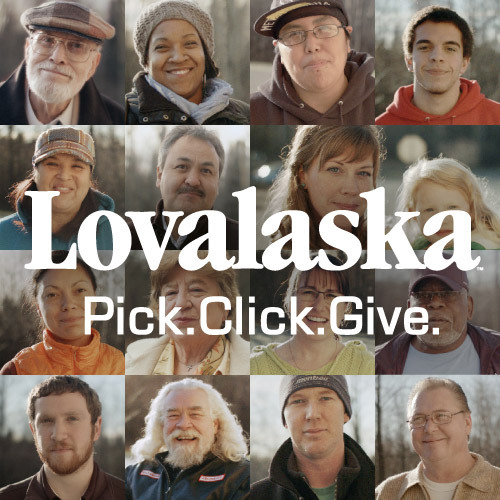 Recently, many Alaskans have chosen to share that wealth with state and local nonprofits through the Pick.Click.Give. program. Your Sitka Local Foods Network joined the Pick.Click.Give. program this year, and we’d like to thank the 56 donors who pledged $2,900 to help us promote and encourage the use of locally grown, harvested and produced foods in Sitka and Southeast Alaska. We thank you for supporting the Sitka Farmers Market, community gardens, a community greenhouse, sustainable uses of traditional subsistence foods and education for Sitka gardeners. You can learn more about your Sitka Local Foods Network at http://www.sitkalocalfoodsnetwork.org/. You also can support us by attending the Sitka Local Foods Network Harvest Fest fundraiser from 6:30-8:30 p.m. on Thursday, Oct. 23, at the Del Shirley Room upstairs in Allen Hall on the Sheldon Jackson Campus. This event will feature a silent auction for a variety of food- and garden-related items and services. In addition, the Lexicon of Sustainability photos will be on display, we will give a short update on the state of local food in Sitka, there will be live music, light refreshments featuring local food will be served, and we will pour locally brewed beer (for those age 21 and older) and root beer from Baranof Island Brewing Company. This is a family oriented event, and there is a suggested donation of $5. 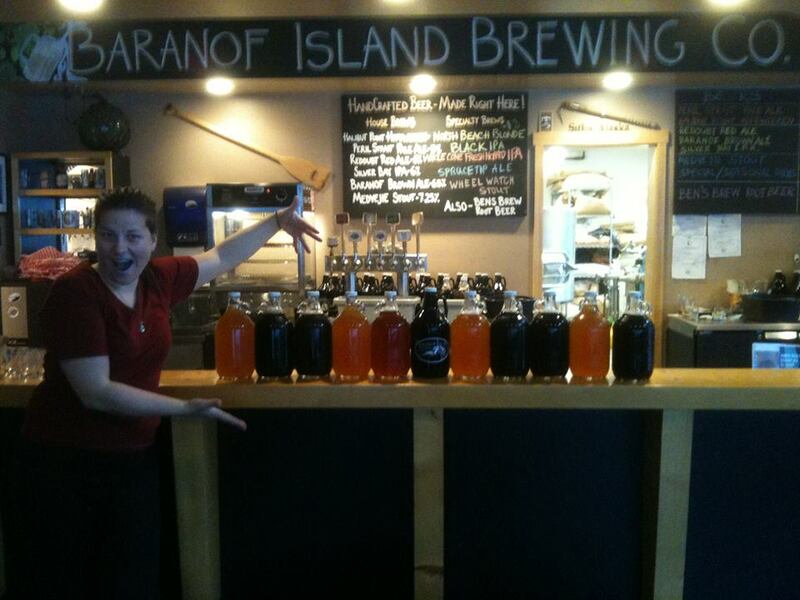 Sitka’s local brewery, Baranof Island Brewing Co. (BIBCO), will host a community night fundraiser for the Sitka Local Foods Network from 3-8 p.m. on Wednesday, April 30, at the brewery’s taproom (215 Smith St.).